When you’re managing multiple job sites, keeping track of who’s doing what work where can be complicated. Even if you have a great system for organizing and keeping track of the information, it takes time to do this manually—and to keep up with the inevitable last-minute changes and fluctuations in attendance and project speed. This can be even harder when you are out in the field roaming around, rather in a fixed location with a computer in front of you. Luckily, ExakTime Mobile’s SiteHub feature makes keeping tabs on all of your job sites a breeze. Select any active job site and instantly see on the right side of the screen who is currently clocked in and on site. This is a great way to take your own quick roll call at each of your sites in the mornings, or to check whether a particular individual is absent—or who has moved from a site that’s wrapping up to one that’s ramping up. This also means you know where to find an employee in case of an emergency. SiteHub can even give you directions to the job site if you need to get there quickly. If something goes wrong in the field, you need to know about it right away. SiteHub provides a real-time feed of all activity at your job sites, from showing real-time clock-ins and clock-outs to alerting you to the latest Field Notes. Field Notes allow workers to document setbacks or progress through photo, audio or text, which then appear in the job site’s live feed in SiteHub. Field Notes are also automatically synced to our cloud-based software, for access from anywhere. With the ability to see incoming Field Notes in SiteHub, you’ll know the details of that job site’s particular situation or problem at a glance—and you can decide from afar how to address it in a timely fashion. Severe weather near your job site? SiteHub pulls information directly from the National Weather Service to alert you about dangerous weather in the area of the job site, so you can see it and notify your team—or give them instructions as needed. Ready to see first-hand how ExakTime Mobile’s SiteHub can benefit your business? 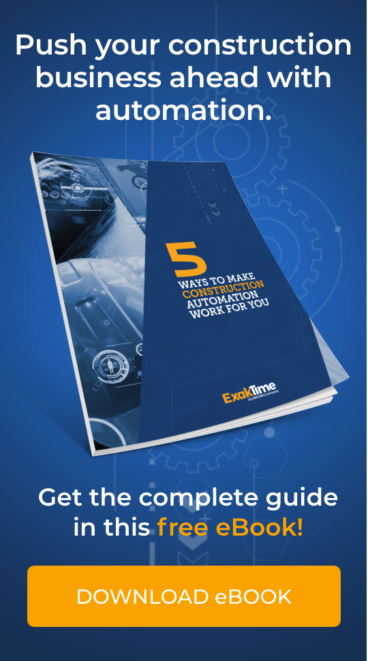 Contact ExakTime for a webinar today! How much is poor data and communication costing your company?